Alfonso X fostered the development of a cosmopolitan court that encouraged learning. Jews, Muslims, and Christians had prominent roles in his court. As a result of his encouraging the translation of works from Arabic and Latin into the vernacular of Castile, many intellectual changes took place, perhaps the most notable being encouragement of the use of Castilian as a primary language of higher learning, science, and law. Alfonso was a prolific author of Galician poetry, such as the Cantigas de Santa Maria, which are equally notable for their musical notation as for their literary merit. Alfonso's scientific interests—he is sometimes nicknamed the Astrologer (el Astrólogo)—led him to sponsor the creation of the Alfonsine tables, and the Alphonsus crater on the moon is named after him. As a legislator he introduced the first vernacular law code in Spain, the Siete Partidas. He created the Mesta, an association of sheep farmers in the central plain, but debased the coinage to finance his claim to the German crown. He fought a successful war with Portugal, but a less successful one with Granada. The end of his reign was marred by a civil war with his eldest surviving son, the future Sancho IV, which continued after his death. Born in Toledo, Kingdom of Castile, Alfonso was the eldest son of Ferdinand III of Castile and Elizabeth (Beatrice) of Swabia. His mother was the paternal cousin of Holy Roman Emperor Frederick II, to whom Alfonso is often compared. His maternal grandparents were Philip of Swabia and Irene Angelina. Little is known about his upbringing, but he was most likely raised in Toledo. For the first nine years of his life Alfonso was only heir to Castile until his paternal grandfather king Alfonso IX of Leon died and his father united the kingdoms of Castile and Leon. He began his career as a soldier, under the command of his father, when he was only sixteen years old. After the election of Theobald I as king of Navarre, his father tried to arrange a marriage for Alfonso with Theobald's daughter, Blanche of Navarre, but the move was unsuccessful. At the same time, he had a romantic relationship with Mayor Guillén de Guzmán, who bore him a daughter, Beatrice. In 1240, he married Mayor Guillén de Guzmán, but the marriage was later annulled and their issue declared illegitimate. In the same period (1240–1250) he conquered several Muslim strongholds in Al-Andalus alongside his father, such as Murcia, Alicante and Cadiz. In 1249, Alfonso married Violante of Aragon, the daughter of King James I of Aragon and Yolande of Hungary, although betrothed already in 1246. In 1254 Alfonso X signed a treaty of alliance with the King of England and Duke of Aquitaine, Henry III, supporting him in the war against Louis IX of France. 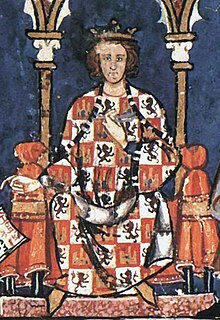 In the same year Alfonso's half sister, Eleanor of Castile, married Henry's heir to the throne, Edward: with this act Alfonso renounced forever all claim to the Duchy of Gascony, to which Castile had been a pretender since the marriage of Alfonso VIII of Castile with Eleanor of England. In 1256, at the death of William II of Holland, Alfonso's descent from the Hohenstaufen through his mother, a daughter of the emperor Philip of Swabia, gave him a claim through the Hohenstaufen line. Alfonso's election as Roman-German king (Latin: Rex Romanorum; German: Römisch-deutscher König) by the prince-electors misled him into complicated schemes that involved excessive expense but never succeeded. Alfonso never even traveled to Germany, and his alliance with the Italian Ghibelline lord Ezzelino IV da Romano deprived him of the initial support of Pope Alexander IV. His rival, Richard of Cornwall, went to Germany and was crowned in 1257 at Aachen. To obtain money, Alfonso debased the coinage and then endeavored to prevent a rise in prices by an arbitrary tariff. The little trade of his dominions was ruined, and the burghers and peasants were deeply offended. His nobles, whom he tried to cow by sporadic acts of violence, rebelled against him in 1272. Reconciliation was bought by Alfonso's son Ferdinand in 1273. In the end, after Richard's death, the German princes elected Rudolph I of Habsburg (1273), Alfonso being declared deposed by Pope Gregory X. In 1275 Alfonso tried to meet with his imperial vicar in Italy, William VII of Montferrat (who had succeeded Ezzelino) and his Ghibelline allies in Piedmont and Lombardy to celebrate the victory against the Guelph Charles I of Anjou and be crowned in Lombardy; he was however halted in his imperial ambitions in Provence by the Pope who, after a long negotiation, obtained Alfonso's oral renunciation of any claims to the Holy Roman Empire. Throughout his reign, Alfonso contended with the nobles, particularly the families of Nuño González de Lara, Diego López de Haro and Esteban Fernández de Castro, all of whom were formidable soldiers and instrumental in maintaining Castile's military strength in frontier territories. According to some scholars, Alfonso lacked the singleness of purpose required by a ruler who would devote himself to organization, and also the combination of firmness with temper needed for dealing with his nobles. Others have argued that his efforts were too singularly focused on the diplomatic and financial arrangements surrounding his bid to become Holy Roman Emperor. Alfonso's eldest son, Ferdinand, died in 1275 at the Battle of Écija against the Moroccan and Granadan invasion armies, leaving two infant sons. Alfonso's second son, Sancho, claimed to be the new heir, in preference to the children of Ferdinand de la Cerda, basing his claim on an old Castilian custom, that of proximity of blood and agnatic seniority. Alfonso preferred to leave the throne to his grandsons, but Sancho had the support of the nobility. A bitter civil war broke out resulting in Alfonso's being forced in 1282 to accept Sancho as his heir instead of his young grandsons; only the cities of Seville, Murcia and Badajoz remained faithful to him. Son and nobles alike supported the Moors when he tried to unite the nation in a crusade; and when he allied himself with Abu Yusuf Yakub, the ruling Marinid Sultan of Morocco, they denounced him as an enemy of the faith. A reaction in his favor was beginning in his later days, but he died defeated and deserted at Seville in 1284, leaving a will, by which he endeavored to exclude Sancho, and a heritage of civil war. In 1273, he created the Mesta, an association of some 3,000 petty and great sheep holders in Castile, in reaction to less wool being exported from the traditional sites in England. This organization later became exceedingly powerful in the country (as wool became Castile's first major exportable commodity and reported a trade surplus, called "white gold", as the wool amount was critical to the health of the population during the winter), and eventually its privileges were to prove a deadly wound in the Castilian economy. One side effect of the quickly expanding sheep herds was the decimation to the Castilian farmland through which the sheep grazed. The original function of the Mesta was to separate the fields from the sheep-ways linking grazing areas. As a ruler, Alfonso showed legislative capacity, and a wish to provide the kingdoms expanded under his father with a code of laws and a consistent judicial system. The Fuero Real was undoubtedly his work. He began medieval Europe's most comprehensive code of law, the Siete Partidas, which, however, thwarted by the nobility of Castile, was only promulgated by his great-grandson. Because of this, and because the Partidas remain fundamental law in the American Southwest, he is one of the 23 lawmakers depicted in the House of Representatives chamber of the United States Capitol. From a young age Alfonso X showed an interest in military life and chivalry. In 1231 Alfonso traveled with Pérez de Castron on a military campaign in lower Andalusia. Writing in Estoria de España, Alfonso describes having seen St. James on a white horse with a white banner and a legion of knights fighting a war above the soldiers of Spain. This vision of a heavenly army fighting in Jerez and participation in military campaigns likely left Alfonso X with a high degree of knowledge and respect for military operations and chivalric knights. Alfonso's respect for chivalry can also be seen in his writing of Spanish law. Spanish Chivalric conduct was codified in the Siete Partidas (2,21) where he wrote that knights should be, "of good linage and distinguished by gentility, wisdom, understanding, loyalty, courage, moderation, justice, prowess, and the practical knowledge necessary to assess the quality of horse and arms (Siete Partidas, 21,1-10)." These efforts to make a codified standard of chivalric conduct were likely meant to both encourage strength of arms (prowess) and to restrain the use of violence for only just (state-sponsored) usage. King Alfonso X developed a court culture that encouraged cosmopolitan learning. Alfonso had many works previously written in Arabic and Latin translated into vernacular Castilian in his court. Alfonso "turned to the vernacular for the kind of intellectual commitments that formerly were inconceivable outside Latin." He is credited with encouraging the extensive written use of the Castilian language instead of Latin as the language used in courts, churches, and in books and official documents (although his father, Ferdinand III, had begun to use it for some documents). This translation of Arabic and Classic documents into vernacular encouraged the development of Spanish sciences, literature, and philosophy. From the beginning of his reign, Alfonso employed Jewish, Christian and Muslim scholars at his court, primarily for the purpose of translating books from Arabic and Hebrew into Latin and Castilian, although he always insisted in supervising personally the translations. This group of scholars formed his royal scriptorium, continuing the tradition of the twelfth-century Escuela de Traductores de Toledo (Toledo School of Translators). Their final output promoted Castilian as a learning language both in science and literature, and established the foundations of the new Spanish language. This evolved version of the Castilian language also acquired significant relevance in the royal chancery, where it came to replace Latin, which until then had been the language commonly used for royal diplomacy in Castile and León. The very first translation, commissioned by his brother, Fernando de la Cerda—who had extensive experience, both diplomatic and military, among the Muslims of southern Iberia and north Africa—was a Castilian version of the animal fable Kalila wa-Dimna, a book that belongs to the genre of wisdom literature labeled Mirrors for Princes: stories and sayings meant to instruct the monarch in proper and effective governance. As an intellectual he gained considerable scientific fame based on his encouragement of astronomy, which included astrology at the time and the Ptolemaic cosmology as known to him through the Arabs. He surrounded himself with mostly Jewish translators who rendered Arabic scientific texts into Castilian at Toledo. His fame extends to the preparation of the Alfonsine tables, based on calculations of al-Zarqali, "Arzachel". Alexander Bogdanov maintained that these tables formed the basis for Copernicus's development of a heliocentric understanding in astronomy. Because of this work, the lunar crater Alphonsus is named after him. One famous, but apocryphal, quote attributed to him upon his hearing an explanation of the extremely complicated mathematics required to demonstrate Ptolemy's theory of astronomy was "If the Lord Almighty had consulted me before embarking on creation thus, I should have recommended something simpler." Gingerich (1990) says that a form of this alleged quotation was mentioned (but rejected) as early as the 16th century by the historian Jerónimo de Zurita, and that Soriano Viguera (1926) states that "nothing of the sort can be found in Alfonso's writings." Nevertheless, Dean Acheson (U.S. Secretary of State, 1949-1953) used it as the basis for the title and epigraph of his memoir Present at the Creation. Alfonso also commissioned a compilation of chronicles, the Crónica general, completed in 1264. This chronicle sought to establish a general history and drew from older chronicles, folklore and Arabic sources. This work enjoyed renewed popularity starting in the sixteenth century, when there was a revival of interest in history; Florián de Ocampo published a new edition and Lorenzo de Sepúlveda used it as the chief source of his popular romances. Sepúlveda wrote a number of romances having Alfonso X as their hero. Alfonso's court compiled in Castilian a work titled General Estoria. This work was an attempt at a world history that drew from many sources and included translations from the Vulgate Old Testament mixed with myths and histories from the classical world, mostly Egypt, Greece, and Rome. This world history was left incomplete, however, and so it stops at the birth of Christ. The main significance of this work lies in the translations from Latin into Castilian. Much like his chronicles, the ability of Alfonso's court to compile writings from a variety of cultures and translate them into Castilian left a historic impact on Spain. Alfonso X is credited with the first depiction of an hórreo, a typical granary from the northwest of the Iberian Peninsula. The oldest document containing an image of an hórreo is Alfonso's Cantigas de Santa Maria (song CLXXXVII) from XII A.C. In this depiction, three rectangular hórreos of Gothic style are illustrated. Alfonso also had the Libro de ajedrez, dados, y tablas ("Libro de los Juegos" (The Book of Games)) translated into Castilian from Arabic and added illustrations with the goal of perfecting the work. It was completed in 1283. Alfonso X commissioned or co-authored numerous works of music during his reign. These works included Cantigas d'escarnio e maldicer and the vast compilation Cantigas de Santa Maria ("Songs to the Virgin Mary"), which was written in Galician-Portuguese and figures among the most important of his works. The Cantigas form one of the largest collections of vernacular monophonic songs to survive from the Middle Ages. They consist of 420 poems with musical notation. The poems are for the most part on miracles attributed to the Virgin Mary. One of the miracles Alfonso relates is his own healing in Puerto de Santa María. Berengaria (1253 – after 1284). She was betrothed to Louis, the son and heir of King Louis IX of France, but her fiancé died prematurely in 1260. She entered the convent in Las Huelgas, where she was living in 1284. Beatrice (1254–1280). She married William VII, Marquess of Montferrat. Ferdinand de la Cerda, Infante of Castile (23 October 1255 – 25 July 1275). He married Blanche, the daughter of King Louis IX of France, by whom he had two children. Because he predeceased his father, his younger brother Sancho succeeded to the throne. Constance (1258 – 22 August 1280), a nun at Las Huelgas. John, Lord of Valencia de Campos (March or April 1262 – 25 June 1319). Beatrice, married King Afonso III of Portugal. Alfonso Fernández de Castilla (1242–1281), also known as el Niño, he held the title of "Señor de Molina y Mesa" through his marriage with Blanca Alfonso de Molina. Berenguela Alfonso of Castile, who married after 1264 with Pedro Núñez de Guzmán but she died young leaving behind no descendants. ^ Bogdanov, Alexander (1996). Bogdanov's Tektology: Book !. Hull: Centre for Systems Studies. p. 27. ^ Musser Golladay (2007:31). Although Musser Golladay is not the first to assert that 1283 is the finish date of the Libro de Juegos, the a quo information compiled in her dissertation consolidates the range of research concerning the initiation and completion dates of the Libro de Juegos. ^ Keller, John E. (2015). Daily life depicted in the Cantigas de Santa Maria. Cash, Annette Grant, 1943-. Lexington: University Press of Kentucky. p. 31. ISBN 9780813159096. OCLC 900344519. Gordon, Stewart (July–August 2009). "The Game of Kings". Saudi Aramco World. Houston. 60 (4): 18–23. Archived from the original on 2009-07-20. (PDF version) Cf. especially section on "The Alfonso X 'Book of Games'". Thomas, Phillip Drennon (1970). "Alfonso el Sabio". Dictionary of Scientific Biography. 1. New York: Charles Scribner's Sons. p. 122. ISBN 978-0-684-10114-9. Wikimedia Commons has media related to Alfonso X of Castile.